The most important question is, why do we need whales and similar large cetaceans in the water bodies of the world? The answer to this question is, like the existence of large mammals like rhino’s and elephants ensure the abundance of food and sustainability of the ongoing activities in the land ecosystem, similarly, the existence of large cetaceans ensure the prosperity and health of the oceans in the world. We should thank the deep sea divers due to whom, abundant mineral rich cold water reaches the bottom of the water bodies, which is beneficial for the survival of the largest source of oxygen in the world, Planktons. This also regulates oceanic temperature by creating vertical currents in the water bodies. Also, the skeletons are huge and highly rich in carbon, hence, when they die and the skeleton sinks to the surface, it carries a lot of carbon down in the ocean, away from the atmosphere. Despite conservation efforts, the numbers have been irretrievably low and could reach to half by 2100. Japan, which was an integral part of International Whaling Commission (IWC) hasdecided to restart commercial whaling from July, 2019. On the pretext of “scientific research”, whaling has been practices in Japan for nearly fifty years. Despite IWC’s ban on whaling, Japan used to sell the meat of the whales by using “scientific research” as a cover story. Consumption of whales has been a long tradition in the island. Dire consequences are predicted by many conservationists for this measure. However, Japan through a spokesperson named Yoshida Suga, has held IWC responsible for only increasing the number of whales and overlooking the aspect of commercial whaling. They have promised to limit their hunting to the economic zones and territorial waters and not pursue the controversial Antarctica expedition. The whale meat consumption in Japan comprises only 0.1% of the meat consumption of the country though the consumption of the meat increased drastically after World War 2 due to high availability and lack of other meats. Foreign and environmental ministers of Australia have stated in an issue that they are highly disappointed by the gesture. Firstly, the IWC restricted whaling but banned totally after sometime. Japan, Norway and many other countries have stated traditions as a way to protest against the ban of whaling. 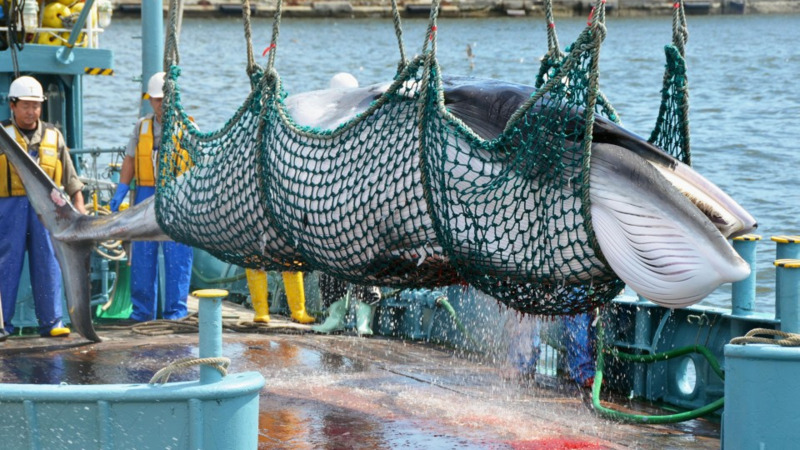 Now, IWC tried to restrict the whaling in Japan but they did not agree and are on the verge of leaving the IWC. The future for the whales, is dark, if Japan does not restrict its tradition of whaling. Rhino's ??? Dear me, how to ruin a piece of writing in 2 sentences. Then we have "planktons", folowed by bones "sinking to the surface" and "whaling has been practices in Japan for nearly fifty years"